Carl Larsson was born in Stockholm, Sweden in 1853. He had a very deprived childhood with his mother having to support his brother Johan and himself. Fortunately, his talent was recognised by a teacher, and during his time at the Art Academy, he became a caricaturist for the humorous paper Kasper. This led to more work as an illustrator for journals and books, together with commissions for large-scale frescos for public buildings, including the National Museum in Stockholm. The vast majority of his paintings depict members of his family, including his wife Karin, whom he married in 1883, and their seven children. His watercolours are characterised by a mass of detail executed in a wonderfully fluid, bright and lively style. 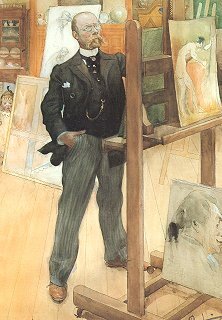 Carl Larsson died on the 22nd of January 1919, just two days after he finished his autobiography. Millennia Designs: Fine counted cross stitch kits inspired by the past.